This article exemplifies tensions between the local Cape Verdean community, Brown University, and government urban renewal developers. Fox Point residents feared their neighborhood would be taken over as University professionals and students moved in, forcing locals out. Many couldn’t pay higher rents and the neighborhood collapsed to gentrification. As a result, families abandoned Fox Point and took the neighborhood’s Cape Verdean Creole culture with them. “It was the dirtiest town, there was so much coal dust pouring into everything and it was pretty run down, the historic district, it was pretty much a slum.” Interview with John Carter Brown. Gorman, Lauren. 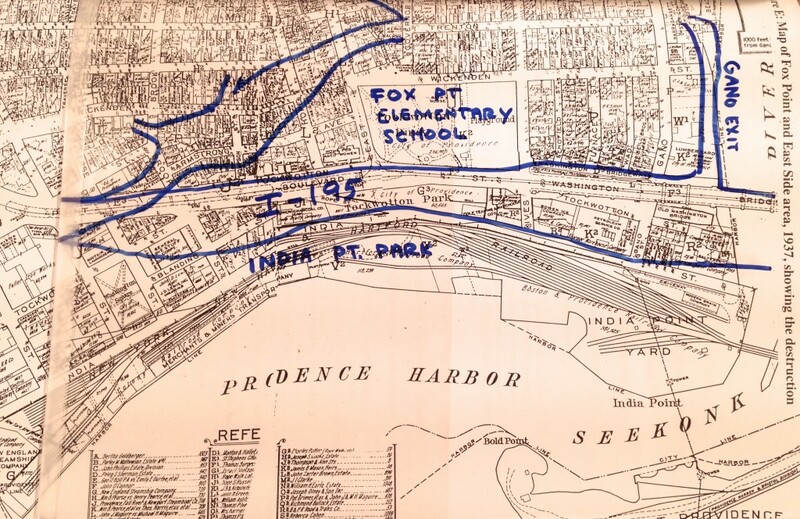 “Fox Point: The Disintegration of a Neighborhood.” PhD diss., Brown University, 1998, 20. The angry and frightened residents of Fox Point are up against a process that is seemingly as inexorable as any catastrophic natural force: that is, the glacial spread of a university, any university, into the surrounding neighborhood. The Providence Bulletin (Providence), 1969. Neighborhoods and communities had something very valuable about them. Streets which looked very crowded and dirty to planner and their ramshackle houses brought together in very important human ways and created human values of care and solidarity… almost no one perceived what would be lost by the eradication of whole neighborhoods. PBS Video. The World the Moses Built. Los Angeles: Public Broadcasting Service, 1989. Brown University moved to College Hill in Providence, RI in 1770, and has significantly impacted the surrounding communities of color ever since. The University’s need for land and space to grow resulted in devastating consequences for communities of color, such as displacement through gentrification and urban renewal projects, and erasure from University history. Starting in the 1920s, Cape Verdean immigrants created a tightly knit, family-oriented, Creole community in Fox Point, College Hill’s southeastern neighbor. 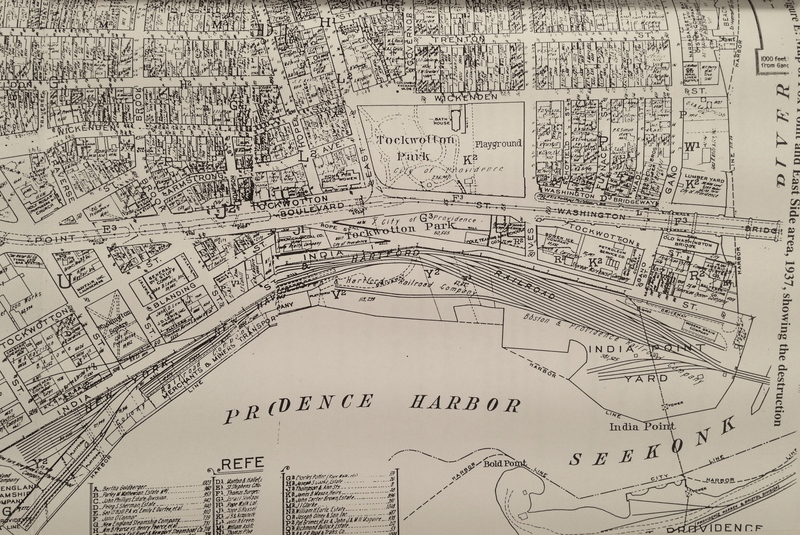 Originally from an island nation famous for seafaring, many Cape Verdean families settled around the Providence and Seekonk Rivers and took jobs as dock workers and fishermen. As the University expanded throughout the 20th century, Cape Verdean families were forced out of Fox Point. 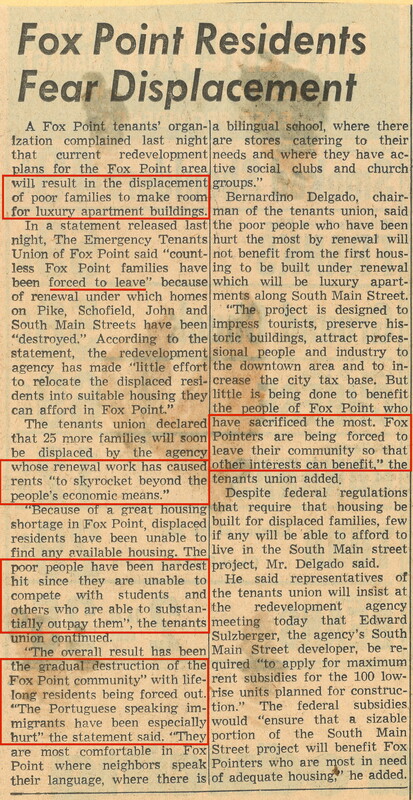 In the 1950s, the University and state government bought cheap tracts of land in Cape Verdean Fox Point, razed all buildings they deemed unworthy of saving, and rebuilt new structures for college students and faculty, who could afford higher rents. Additionally, the construction of I-195 cut directly through the Cape Verdean neighborhood, destroying existing houses and businesses, despite community-led resistance. “They priced you right out, so we moved. Besides losing a diversity of residents, the Fox Point neighborhood lost a community that once felt like an extended family, where everyone knew and looked after each other. Thus, the intricate network of Fox Point became a diaspora of Cape Verdeans. In recent years, there have been reclamation efforts of the erased history of Cape Verdeans in Fox Point. Remembering this history of gentrification is crucial as Brown celebrates its 250th anniversary, and continues to expand into and wield significant influence over the city of Providence. Interview with Janet Walsh, former Fox Point resident, Portuguese descent. October 10, 1997. Gorman, Lauren. “Fox Point: The Disintegration of a Neighborhood.” PhD diss., Brown University, 1998, 72. Gorman, Lauren. “Fox Point: The Disintegration of a Neighborhood.” PhD diss., Brown University, 1998. Interview with Charles Andrade, former Fox Point residents, Cape Verdean descent, current Deacon of St. Joseph’s Paris. Interview was conducted at the Fox Point Boys Club Reunion, November 2, 1997.